Mourning A Mentor: Students Pay Tribute To Marable The Columbia University professor did not live to see the publication of his life's work, a new biography called Malcolm X: A Life of Reinvention. The book was released Monday, just days after Marable, 60, died Friday of complications from pneumonia. 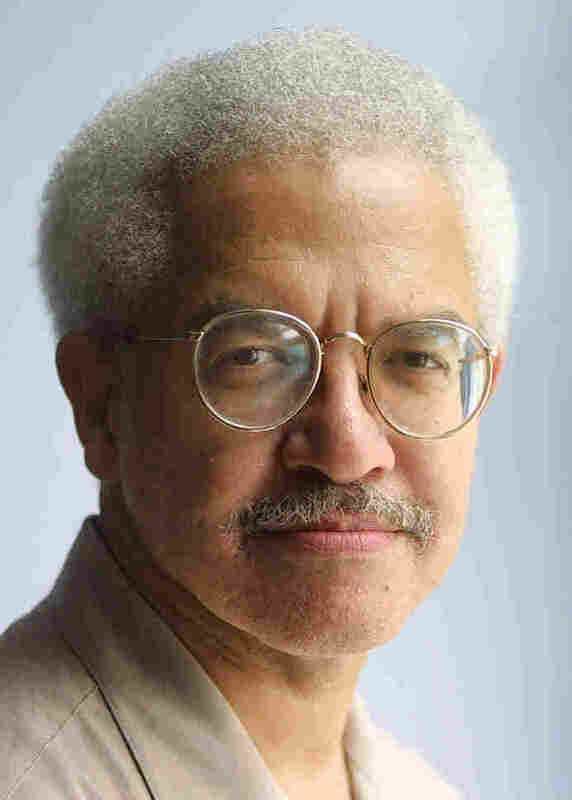 Manning Marable, pictured above in 2001, died Friday, just days before the publication of his life's work, a new biography of Malcolm X. "He was trying to save people with his ideas," says Marable's researcher, Zaheer Ali. Columbia University professor Manning Marable did not live to see the publication of his life's work, a new biography called Malcolm X: A Life of Reinvention. The book was released Monday, just days after Marable, 60, died Friday of complications from pneumonia. Marable was the author of 15 books and a multitude of scholarly articles. He founded Colgate University's Africana and Latin American Studies program as well as the Institute for Research in African-American Studies at Columbia, where he was a mentor to countless students. Three of them gathered in the late scholar's office over the weekend to discuss why Marable was such an important influence on them — and on African-American research in the U.S.
Zaheer Ali was the main researcher for the Malcolm X biography that Marable had been working on in one form or another for decades. "He had this massive timeline for the Malcolm X project," Ali remembers. "It was this huge Excel chart that if you printed it out it would be over 100 pages." Marable used the chart to track discussion — from The New York Times to the FBI to the Muhammad Speaks newspaper — of events in Malcolm X's life and career. Ali is just one of a generation of African-American scholars and public intellectuals who came of age influenced by Marable's work. "When I got to campus the first question you were asked is, 'Have you seen Manning?' " Ali recalls. "It was almost like a rite of passage." In addition to creating the Institute for Research in African-American Studies, Marable also founded the Center for Contemporary Black Studies. He encouraged rigorous scholarship and inquiry around radical historical figures and revolutionary movements: topics that were — until Marable's efforts — on the fringes of serious scholarship. Doctoral student Elizabeth Hinton, the editor of Souls, Marable's journal of black culture, remembers him as "unapologetic" about his politics. "In conversation with him, he would quote Trotsky and Lenin and Marx and Du Bois," Hinton says. "For people who were interested in a different social vision of the world and wanted to, very much in the spirit of Manning, use scholarship and political theory and historical research to envision a different kind of world, this is the space on campus that he created." Marable's political ideas sometimes put him at odds with his peers in the field of black scholarship. But Robyn Spencer, Marable's first graduate student at Columbia almost 20 years ago, says he had a way of opening people's minds and making his work accessible. Prof. Marable was willing to engage people with whom he had publicly disagreed — and do it civilly and with integrity. "He was funny, he was always laughing," Spencer says. "He was irreverent, in some ways. He took historical actors that people think are larger than life, he brought them down to Earth. He would call Angela Davis 'Angie.' ... He made everyone accessible; he made you feel like you could access those people as well." Marable embraced "transformationist" politics over nationalism or separatism — the idea that African-Americans could and should transform society by changing institutions in partnership with others. His interest in chronicling the black experience across ideological lines led him to exchange ideas with people of all political stripes. Ali remembers the time Marable took him along for a face-to-face meeting with Louis Farrakhan. "I was a little nervous," Ali remembers. "They had never met before, and Professor Marable had written very critically about minister Farrakhan's nationalist politics." What began as a two-hour meeting turned into a six-hour meeting followed by dinner. "I watched two grown men have an intelligent, critical discussion about the meaning of black life in America," Ali says. "It was an important example of how Professor Marable was willing to bravely and courageously engage people with whom he had publicly disagreed — and do it civilly and with integrity." The students whom Marable had mentored over the years call his presence on campus nothing short of a "revolution." By bringing fringe ideas into the mainstream, Marable found a way to challenge the existing canon — and create another.